This has to be the first item I baked this year if I recall correctly. The opening item of the year was supposed to be a chiffon cake but I simply did not have the courage to beat the eggs to the right "stiffness" when I woke up this morning. After much deliberation and hunger, I chose a supposedly easy recipe from HHB's site - Raisins & Chocolate Chips Muffins. It seemed easy enough, just whipped everything in a saucepan, into the paper cups and out of my easily overheated oven in 20 minutes. Since I do not have muffin cups or tins at the moment, with only cupcake paper cups, I ended up with cupcake looking muffins instead. As a note to self, the next time I'm doing this, I'm going to add a bit more butter to give them more moisture and definitely less sugar as I can't take sweet stuff too well. Oh, this recipe goes very very well with a nice cup of English tea on a cool afternoon. Adapted from HHB. I halved everything. Place egg, melted butter, milk and sugar in another bowl. Add chocolate chips, raisins and mix with a spatula. Make a well in the centre. Pour the liquid mixture into the flour. With the spatula, gently fold all the ingredients to form a wet batter. Just mix until the flour are incorporate into the batter. DO NOT over mix. 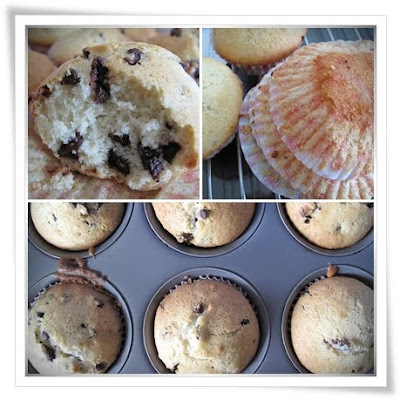 Spoon batter into paper muffin cups. Bake for 15~20mins (mine took almost 25mins) until muffins turn golden brown or a toothpick inserted into the centre comes out clean. Hi, Ronni, I won't suggest that you increase the amount of butter, it may affect the end result. You can reduce the sugar a little but not too much. Sugar also helps to keep the bake moist. Baking is a Science, the amount of butter, sugar plays an important part. It is better to follow recipes as closely as possible. Congrats on ur first post! !